Samsung has replaced many leading brands worldwide in its efforts to become the number one player in the smartphone market. That most Samsung phones runs on Android is well known, and Samsung has finally released Galaxy Grand duos smartphone in India at Rs 21,500. The Galaxy Grand, it is believed will actually come in two versions with one of them a Galaxy Grand duos. 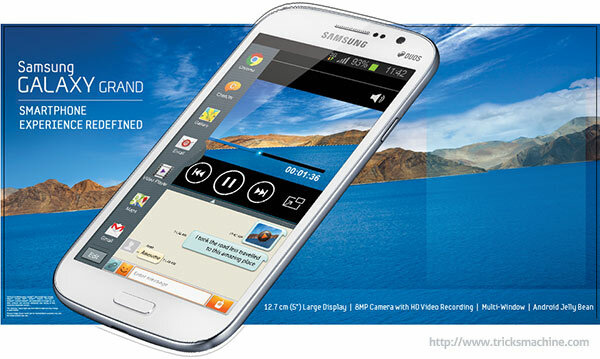 Samsung has launched the dual-SIM version of the device in India. Both versions will have the Jelly Bean Android, though not the latest version, in them and will have dual core processors to power them. The processor speed specification is 1.2 GHz. Galaxy Grand duos – What’s New? The display size is 5 inch, which is bigger than the Galaxy S3, with an overall dimension of 143.5 by 76.9 mm by 9.6 mm, making it one of the thinnest in the smartphone genre. The approximate weight is 163 grams. In spite of several improvements, you should expect the Galaxy Grand not to have the same sharpness or resolution like the S3 or Note 2, and that is because the screen resolution has been considerably brought down to 480 x 800 with a pixel rating of 189. However, you will certainly like the TFT capacitive multi-touch screen. The other features are all really captivating, notably the GPRS, Bluetooth v4.0 and EDGE. In addition, the Galaxy Grand is compatible with HSDPA that can support internet connectivity up to 21 Mbps and HSUPA at 5.7 Mbps. WiFi configurations enables it to be used in hotspots and is tethering enabled as well. There is also an USB port through which the device can be connected to other devices for loading data, though serially. The other interesting utility is the jack for earphones which has been placed very ergonomically for easy handling. Storage wise too, Grand Galaxy is something to talk about. RAM memory is 1 GB and storage is 8 GB though you can expand it to 64 GB by including a SD memory card for which a slot is provided. The Galaxy Grand duos dual SIM version uses the swapping technology which will bring down energy consumption thereby extending battery life considerably between charging cycles. Power source is a 2100 mAh battery which comes as a standard fitting. Though the battery capacity is impressive, it may be sometime before the actual working efficiency can be estimate. For camera buffs, the combination of dual SIM and 2 great cameras may be a great point for buying this mobile. The rear camera is more powerful like any other and is 8 MP with a flash included. The other feature of the rear camera is it has auto-focus with zero shutter lag making it perfect for sharp images. The front camera is 2 MP, though it is a HD webcam, there isn’t much you can talk about it, but still great enough for common photography. The Galaxy Grand & Galaxy Grand duos phone priced at Rs 21,500 and comes with a flip cover along with Rs 8,000 worth of free movies and music plus 50GB of free space on Dropbox as part of the introductory offer by Samsung. You can buy this phone online from here. NFC Vs AirDrop : Which Is The Way Forward?